Thanks for your recipe. Which Bread maker is good? Mine is just a basic model. When comes to buying a bread maker, it all depends on your budget and what you want. I just want one to help knead flour and bake some basic loafs, so I go for the most basic one. However, compared with the one my friend has, I'd like to get some more functions if I buy another one, like "bake only" mode or "delay" mode, mode because I want to have more flexible designs. I heard good reports of Panasonic. You might like to check this one out. That's the one I used, white bread flour (protein=12.5%). The texture of the bread we bake is also determined by vary aspects, including kneading and combining with other ingredients. Try this recipe to see if the result you'd like to have. I have tried to use this recipe to make hongkong style saguage bread. They are really soft and tasty..Thanks a lot. And i think this recipe is more simple than the recipes list on 65度C湯種麵包..
Glad to know you're succeeded in making soft and tasty sausage buns. I nearly forgot these cute and yummy snacks, should make some for my family on weekend. Thanks for letting me know. The dough has to be cut into four equal parts. Then roll each part from top to bottom. So, you have four little rolled parts fitted into the mould. If I want to use some other bread recipes, should the amount of the 湯種 be part of the recipe or is it extra amount to be added to the recipe? Thanks! That said, the tangzhong is 20% of total weight of all the wet and dry ingredients of any bread recipe. Calculate the tangzhong: 1 part of flour with 5 parts of water on that 20% part. Then you have to subtract the amount of the flour and water used in tangzhong from the main ingredients. Note: I haven't tried this method yet. It sounds good though. If you find this method works, come back and let me know. Thanks for sharing, your bun looks really great and yummy! question: There is no warm liquid in the ingredient for the dough? Doesn't yeast need something warm to work its magic? Yeah, you're right. Very often, we put yeast in warm water with sugar. But for this recipe, the 快速酵母（Instant Yeast）doesn't need this step to activate. It can work instantly when add in other ingredients. Having said that, you can keep the step of warming the yeast if you like, or use the step to make sure your yeast are still effective. Thank you so much for the detail procedures. I will try this recipe within these days. I've always got a problem. The bread always came out good from the oven, but the next day it will turn dry which is hard to swallow it. :) I am very excited for this new recipe. will definitely give it a try. I'm going to try this recipe tomorrow. My bread machine has "Basic" an "Dough" mode. Should I use "Dough" mode instead of basic mode? By the way, I will also make 焗焦糖蘋果豬扒 again tomorrow. I just tried this first time yesterday (told you in Facebook), my husband loves it so much and he bought more porkchop and apples today. If you just want your bread maker to do the kneading job for you, then use "dough" mode. How long would your bread maker take when finish kneading. Mine only takes 15 minutes. So I have to turn on my bread maker again. I use mine to knead dough for 30 minutes totally. The "basic" mode normally includes the whole process of kneading, proofing and baking. You have to read your manual and understand how your bread maker works before you go ahead. if i put dried grapes, do i still need to roll the grapes in or just randomly mix them into the 麵團?? I wana make the raisin bread,when should I put the raisin? 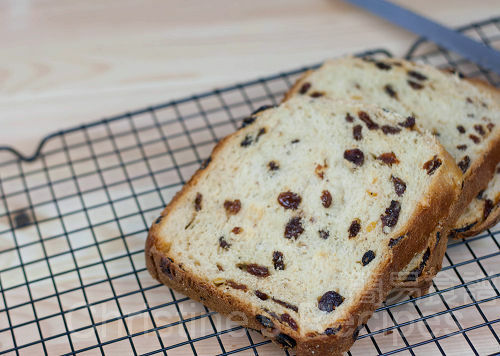 If you want to make raisin toast, you can mix them in when the dough is gathered together. 如果麵粉本身有raising powder, 還要加instant yeast 嗎?? I was typing my comment and suddenly hit the wrong button and lost everything. Wonder if that message went through! Anyways, I'd like to thank you for sharing all these wonderful recipes, especially for food that we usually buy but never homemade in HK. Now we are living in a small town in USA and there's nowhere we could buy all those yummy food. One question: I realized you have a different recipe for making Cha Siu Bao. Do you think it would work if I use this tangzhong recipe to make cha siu bao? Of course, I would bake them as separete buns instead of putting in one bread pan. Sorry, sometimes the commenting system plays up and delays. I think the tangzhong method is great to make cha siu bao. Sure, it's softer in texture. Thanks so much for sharing yr wonderful recipes with us. Could you please give me the name of the shop where you got the pastry board . I live in brisbane. I bought it from Reject shop at Sunnybank Plaza. Isn't it gorgeous? Believe it or not, it's tempered glass actually. I just got it for 9.5 dollars. The bad news is that they don't stock any at the moment. Keep an eye on their stock or ask if they can order one for you. Thank you very much for sharing your recipe and baking technique. I tried this today and using the Dough mode. I let the machine finished the entire process and the dough did expand to twice as much. However, when I took out the dough, it's still very sticky and it's kind of wet on the bottom portion. Is it normal? I had to add more flour when doing the final kneading myself. After baking, the bread came out OK, a little chewy, not as fluffy as I thought I should be. Did I leave the bread in the machine for too long? Thank you! If your dough is wet on the bottom, it's not normal. The wet ingredients should be incorporated well. I'm afraid your bread was not kneaded enough and generated enough gluten inside. That might be the cause of your bread turning out chewy. Did you check your dough after kneading? Could you spread it to a thin membrane? Yes, I could spread it to a thin membrane but it's kind of sticky (so I have to powder my hand). I tried again then the 2nd time the inner part is kind of moist and sticky. The bread came out OK though. I set my machine to "Dough" mode and normally it took 1.5 hour to complete the entire process. Is it not enough? Too long? I made a loaf with bacon and scallions. 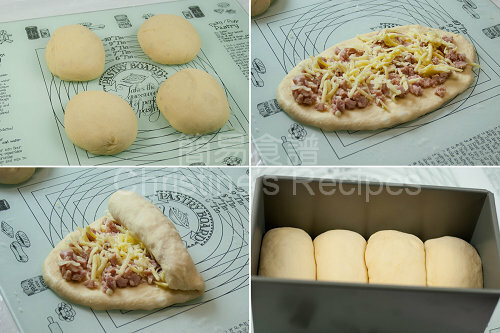 I took out the dough after it finished kneading, mixed the bacon and scallions in one big dough. Then, I put it back to the bread machine and let it complete the remaining cycle. The loaf came out just perfect. My kids had almost finished them all. Thank You for sharing! As far as I know, the real kneading time in dough mode won't take 1.5 hour that long, only about 20 or 30 minutes or so, then it rests. If the surface of the dough is not sticky, it's ok then. Glad to know that you've got a big success in making tangzhong breads. Congrats! 1. 用180C焗咗40分鐘, 外皮已熟及開始有小小焦, 但入面仲未熟透. 下次應該用大D火/細D火, 長D時間? anyway, thank you for sharing the recipe, I will try again and let you know the result!! hello , can i use hand mixer instead of the machine? Given you have to hold the hand mixer for a long time, it might not be a good idea. And the batter would stick to the whisk, it's very difficult to knead the dough properly. 謝謝你的食譜, 學了你的食譜煮食, 非常容易, 而且很成功. 超讚! 有問題想問, 你的pastry board好靚, 在哪兒買的? 我生活在newcastle的, 不知有沒有得賣? hi Christine, shud use raw or cooked bacon? and cheese, which type to use ? Use cooked bacon. It's better. What is the English for 奶粉? Can I use milk instead? 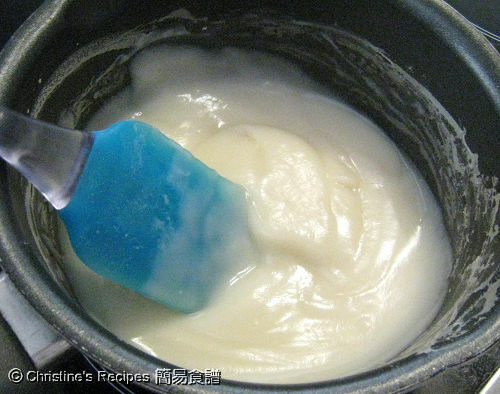 奶粉=milk powder, it's for enhencing the flavour. You can skip it, if you don't have nay. I got it from a supermarket nearby. You should find some at any supermarkets, in bakery section. I'm from Brisbane as well. I'm just wondering where you get the white bread flour? Is it just from coles or woolies? Do you mind telling me which brand you used? p.s. I tried your iced skin mooncake recipe today. I modified a bit and made matcha and coffee flavour. Thanks for sharing! Happy moon festival! I'm using Defiance, White Baker's Flour, 5kg packet, got it from Coles. I think Woolies would stock some. Check out the price if you like to try. 另外, 我其實是有麵包機的...不過說明書不見了.... 但我搵唔到我的機有basic or dough mode.... 只係1-12定1-13個function button, 而其中一個係發酵mode.... 開動時係會轉動及時間係顯示一個半鐘頭的.... 那麼我是否用呢個mode 用來搓粉團呢? Thanks for all the great recipes. I wonder why the butter have to wait until the dough is form. Is it ok I put the butter/oil with all the wet stuff in the bread machine? The softened butter/melted butter has to be added until the dough comes together because you don't like the gluten inside can't be generated properly. If butter is added too early, the bread won't be good. the outcome for the cheese n bacon i tried is v good, tasty n soft n can c the texture of the 汤种 bread. now i m in the process baking the hokaido bread ll let u know the outcome, but one thing v different fr others, my dough for the hokaido bread is not sticky but the bacon n cheese is sticky, not sure y. Thanks for your visit and love of my recipes. Are you baking for people with diabetes? Please take note that this recipe is not for those with diabetes, and the substitute with brown sugar won't make any differences or doesn’t do any good to people with diabetes. Sugar is not the leavening agent and can’t help the dough rise. Yeast does this job actually. Having said that sugar can help yeast grow more quickly. Many recipes without any sugar can also make dough rise high. For the texture of the bread made from this recipe, it’s due to enough gluten generated inside the dough after kneading, not because of the sugar. The Tangzhong is to help add moist into the dough so the bread can be kept soft for days. Please check your dough before popping it into the oven and see if it’s passed the windowpane test. thanks Christine for the lovely and easy receipt. This is Elaine (again ;-p) thanks for your reply, i didnt bake for diabetes patients, is just my parents n uncles dare not take too much sugar, so i ll try to bake this recipe without sugar one day, n let u know the outcome. Ever since i found ur blog, lov it soo much, it makes cooking, baking easier. This round would like to check with you whether i can substitute butter with olive oil or grape seeds oil? if yes, when to put this in? Lately i try to bake tis recipe by using red bean, it comes soo nice n soft, my boy says v soft, as i finally knew tat the timing to knead is abt 45-50 mins in order to get an elastic dough. Thanks again for your sharing and Happy New Year !!!! You might substitute any vegetable oil you like, as long as the flavour is not too strong. When the dough comes together and generate a bit of gluten, you can add the oil. I kneaded with my hand.omg! it is sooo sticky. I just gave up and bake it anyway with the sticky dough. It still came out nice and soft! Should I add more flour if it's too sticky? It's fine to sprinkle a little bit of flour on the surface to help from sticking. But don't add too much, otherwise it will hurt the texture of the bread. 我按住你以上食譜做面包 (用面包機;用的係焗爐面包機2合1)，但出來的面包面頭都係相當硬 (唔似你相片的鬆軟)，請問係咩原因? 係咪太多蛋汁? 係咪焗太耐? 定係粉搓得太耐(面包機default 30 mins)? Christine: thanks for posting your recipe. I never make bread before, after reading you recipe, especially the picture you posted that make my mouth watering, thus attempted to try. I follow you recipe and made some wonderful braed. It was light and fluffy and like you said even after few days just put it in toaster oven the bread will be soft again. However, the favor of the bread I found is nothing special. I'm working on trying to play with different recipe to come up with something that suits my taste. Thank you again for posting the recipe!!! I'll try your 蛋挞 next. Simple and easy recipes are shared here, that's all about this blog. 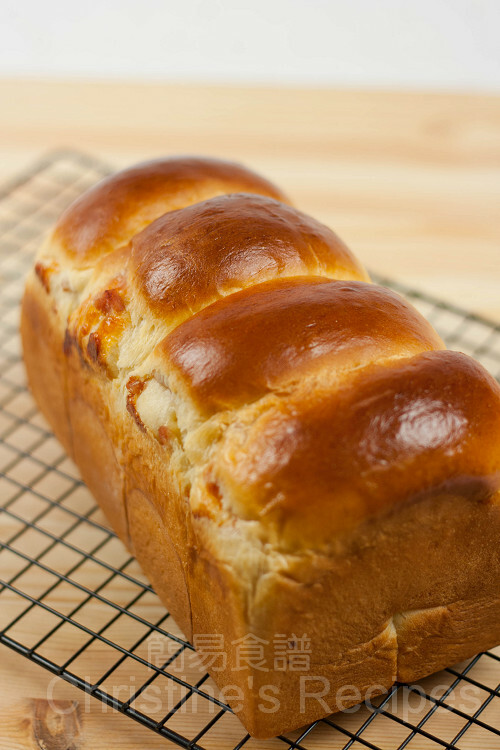 Many readers like you who never tried baking breads before, responded to me that they were intrigued by these easy recipes and simple-looking breads. So they started baking breads after visiting this blog. Having got some experiences, you could add some other flavours you like and make your own versions. 請問應該選用哪一種芝士? 硬的/軟的/卡夫? 因為有太多種類, 不知哪一種才適用於整麵包! 謝謝.